5. The daytime can now be entered. 7. The time will now be sent to the Scoreboard. 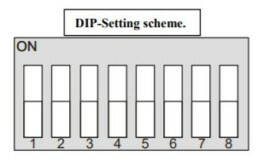 Before replacing the damaged Text-display, locate the DIP-Switch on it and write the setting down on the DIP-Setting scheme. It is important that the new Text-display has the same DIP-Setting as the one it is replacing. 1. Turn off the power for the Scoreboard. 2. Dismount the scews in one of the sides of the Scoreboard, and remove the metal bracket. 3. Remove the Acryl covering the Text-Display that must be replaced. 4. Unscrew the screws holding the Text-display in place. 5. Disconnect the Ribbon Cable mounted on the old Text-display. 6. 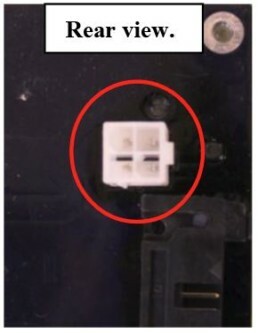 When removing the old Text-display, disconnect the 4 pin rear connector. 7. 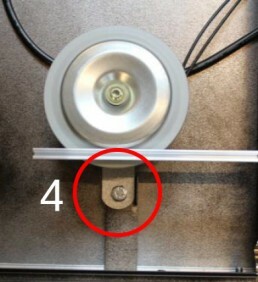 Before the new Text-display is mounted, make sure the 4 pin rear connecter is properly connected. 8. Reconnect the Ribbon Cable. 9. Set the DIP-Switch on the new Text-display, according to the DIP-Setting scheme that was filled in the top. 10. Turn on the power for the Scoreboard, and check that the new Text-display is working. 4. Dismount the Ribbon Cable mounted on the old Digit. 5. Unscrew the screws holding the Digit in place. 6. Discmount the hold Digit. 7. Mount the new Digit with the enclosed screws. 9. Set the DIP-Switch on the new Digit, accordring to the DIP-Setting scheme that was filled in the top. 10. Turn on the power for the Scoreboard, and check that new Digit is working. 1. Turn off the power from the Scoreboard. 2. Dismount the screws on the right side of the Scoreboard, and remove the metal bracket. 3. Remove the Acryl covering the Horn. 4. Unscrew the bolt holding the Horn in place. 5. Remove the black cable from the old horn mounted on the NGI-85. 6. Mount the new Horn with the washer and bolt. 7. REconnect the cable from the new Horn on J7. 1. 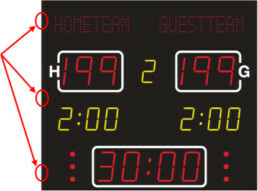 Locate the power inled in the bottom of the scoreboard frame. 2. Remove the cover and disconnect the power cord. 3. 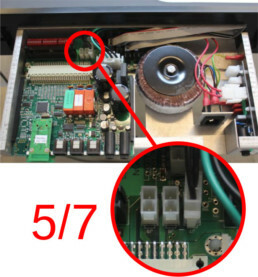 Remove the two screws retaining the NGI-85 Power supply in the scoreboard frame. a. The NGI-85 power supply has hinges that prevents it from falling out of the frame. 4. Gently pull the NGI-85 power supply out of the frame. 5. 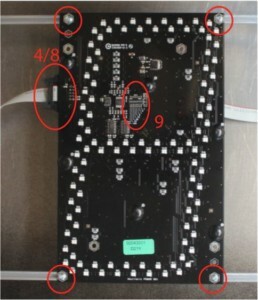 Remove all the cables connected in the NGI-85 power supply. a. 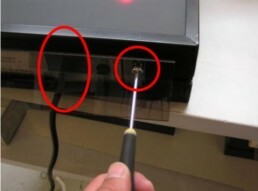 The ribbon-cables do not need to be reconnected in any special order or placement. 1. Step 2 - Switching the NGMCB controller card. 1. Remove the retaining plate holding the NGMCB controller in place. 2. Gently pull the NGMCB controller out of the scoreboard. 3. 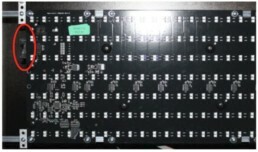 Install the NGMCB controller in the new NGI-85 and reinstall the retaining plate from part 1. 1. 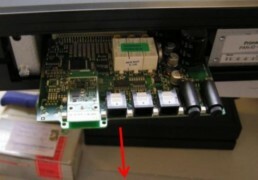 Place the new and old NGI-85 power supplies beside each other and locate the DIP-switches in the top left corner. 2. Set all the DIP-switches in the new NGI-85 as it was on the old. 3. Reassemble the scoreboard in reverse order. 3. Remove the retaining plate holding the NGMCB controller in place. 4. Gently pull the NGMCB controller out of the scoreboard. 5. Install the new NGMCB controller and reassemble the scoreboard. 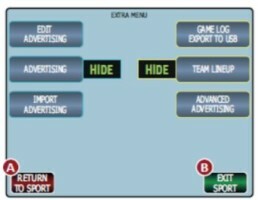 This part will only concern you if multiple scoreboards are installed within 100 meters of each other. 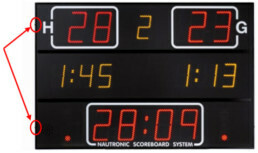 When the software of the scoreboard has been updated, all settings will be set to default. 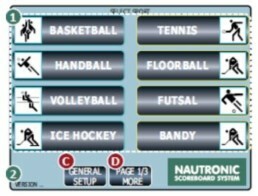 Therefore the Zone information has to be retransmitted from the NAUCON-1000 control panel to the scoreboard. Turn on the control panel. Go to the General Setup. Go to the Service Menu, password is: 1166. 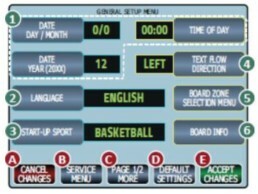 Go to page 3/7 and enter Board Zones setup. Press the Accept button. 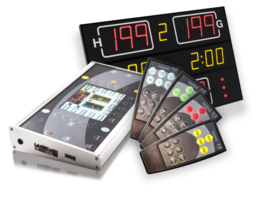 The control panel will now transmit the Zone data to the scoreboard.